In Vietnam, farmed animals are both extensively and intensively farmed, meaning they live in small herds with families and on concentrated feeding operations with tens of thousands of animals. 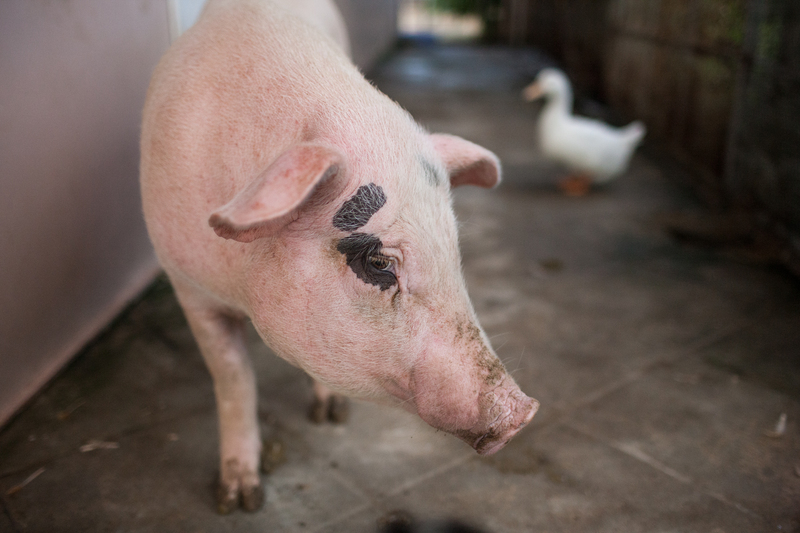 Many of these pigs, cows, chickens, water buffalo, and ducks suffer tremendously throughout their short lives as they are used by humans for profit. This is not a function of the lack of legislation or enforcement, because animal welfare laws and reliable enforcement agencies exist in developed countries and abuse continues unabated. It is a result of the fact that they are property of humans used for their own pleasure, amusement, and convenience. The solution is not to focus on the treatment of the animals, but that they are being used at all. After all, it is use of animals that we want to end, not simply suffering. If we continue to fight for “reduced suffering” or “better welfare” for animals who continue to be slaughtered unnecessarily for economic gain, we are actually aiming for something no one really wants if the end of exploitation is the goal. As abolitionist vegans, we know that adding regulation after regulation in a country that can not even enforce its traffic rules does nothing to end the suffering of the millions of animals consumed for food, fur, leather or other purposes. It perpetuates the growth of the industry and widens its appeal to consumers. Ending the demand through marketing campaigns and education is for more cost-effective and efficient than constantly working towards an end that does not actually ever stop exploitation of animals. The lack of effective public human and animal health infrastructure in Vietnam make regulations for animal welfare and food safety very difficult to enforce. Within the confines of a corrupt bureaucracy, lobbying for legislation should be considered only one part of a multi-pronged approach to protecting animals, but people need to also be aware of the limits of this strategy, especially in the short term. As a long term strategy for ending animal exploitation, we must consider that building a social movement for animal rights will be the best base for any political moves. The Vietnamese government continues to push for greater intensification of animal production for economic purposes, and if we do not work to educate people on the detrimental effects of animal consumption on the environment, human health, and animal rights, we are going to be fighting upstream. Until the animal rights movement truly integrates itself with other development sectors and uses sound economic theory and evidence-based methodology to apply its logic, then we will continue to see little progress in the fight against animal exploitation. The rescue shelter is entirely vegan with the exception of dog and cat food. Our staff promote vegan restaurants and cooking classes in the area and we have vegan cookbooks at the shelter. In our education program with children and animal welfare organizations, we stress that all animals, regardless of their utility to humans, have rights and that the Five Freedoms of Animal Welfare extend to both animals and humans. Our farm sanctuary, the first in Vietnam, is be a big part of this education work as we allow visitors to see that the animals that society considers something, are actually someone.